The first line of the description sums the book up perfectly; Raw and moving. While reading this book, I think I experienced every emotion imaginable. I laughed, I cried, I got angry(very angry!) and I got sad. 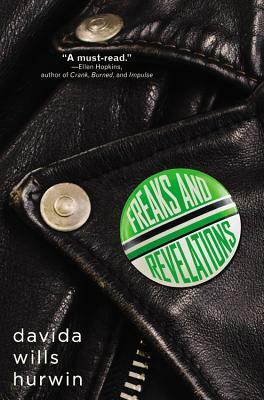 Freaks and Revelations is written in 2 perspectives. Two very different perspectives. We are first introduced to Doug, and it doesn't take long to see that he wasn't given a good hand when it came to his family. There were many different times I said to myself "No wonder he is so angry and withdrawn" I think many of us would be if we had to deal with what Doug had to deal with. Then we are introduced to Jason, a fun, kind-spirited boy, with the world at his finger tips. We quickly see his world come crashing down when he reveals to his family that he is gay. I want to say how well the author delivered these characters, but that would be wrong. These were not characters, these were real boys and now grown men. Although she had changed their names for her book, their stories are unfortunately true...brutally true. The author did a wonderful job at describing the horrible world these boys were sucked into. I could see the steam rising from the sewers and I could smell the dumpsters behind the restaurants. Yes, although at times it wasn't the most pleasant of reading experiences, it was raw, dark, emotional and even ugly at times, but it was very powerful. One of the most powerful reading experiences I have had with a book in a very long time. For the fans of Laurie Halse Anderson and Ellen Hopkins this book is a must read. Did you enjoy Thirteen Reasons Why or The Perks of Being a Wallflower? Then you need to add this to your reading pile! A very strong, and powerful novel. One that will stay with me for a very long time. I love books that are so emotional. I'm a little scared to read this because of the idea that it is a true story, but these are the type of books everyone needs to read to understand things. Beautiful review!